Rather than provide a long list of what is included or excluded, we would prefer that you contact us and arrange to discuss your ideas and requirements. We can organise for you to view some of our completed homes, and decide which style and features you would like your home to have. Our bottom line is that if you decide to commission us to build your home, you will get a home that involves your design and decision making and that will be of a comfort level and quality that you can live in all year round. We will have another satisfied customer and a home that maintains our reputation. We use locally sourced stone when building traditional Cretan homes. If required we can use reclaimed stone to enhance features of your new home, such as elongated arches, door and window surrounds and use quarried hand worked stone for the remainder of the structure. Our stone houses are constructed using traditional stone masonry techniques using hand cut stone which, although labour and skill-intensive, remains the best technique to use, compared against modern veneered or cladded stoneworking where thin, flat stone pieces are glued against a wall of concrete blocks. Many of our competitors pass this technique off as traditional stone built houses. Stone is strong, has thermal properties and blends with the landscape. Historically, stone was used in the earliest dwellings and is without doubt the oldest construction material known. Many ancient structures found in Crete are a testament to the durability of stone, which is still a superior construction material when compared to other materials and is under utilised in view of it's widespread availability. 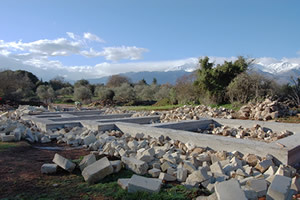 Dry stone stacking is the earliest form of stone construction seen in Crete, often in the shape of walls, terracing, bridges and shepherd huts. An observant eye will notice that these structures are generally wider at the base than at the top - and this is where the structures gain their strength, as the weight of the stone locks together under pressure, and gives the structure its durability. Is all stone the same? Any geologist will inform you that there are three main stone types - igneous (hard, non-porous, granite), sedimentary (soft, porous, sandstone or limestone) and metamorphic (hard, non-porous, marble or slate). For home building purposes, granite, sandstone and limestone are good materials for building the walls of your home and external features. Slate is only suitable for roofs and floors. In Crete the predominant stone is sandstone and limestone. Is stone a sustainable/green building material? Stone is a natural highly durable, low maintenance building material with high thermal mass. It is versatile, available in many shapes, sizes, colours and textures, and can be used for floors, walls, arches and roofs. Stone blends well with the natural landscape, and can easily be recycled for other building purposes. To meet generally agreed sustainability standards, stone structures should be built from either stone found on site, reclaimed from nearby demolished buildings or sourced from a local stone quarry. The foundations of your home must be solid for a variety of reasons. In the case of stone built homes, the foundations must be strong enough to support the weight of the stone above, and reinforced to meet current international seismic standards, designed to withstand earth tremors. 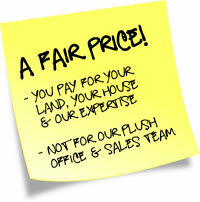 Your architect and construction engineer will specify how the foundations should be constructed. We will follow their plans. Foundation walls constructed with stone must be a minimum of 80cm thick, reinforced with steel and infilled with cement. Exterior walls, from the ground floor level must be 50cm in width. Interior load bearing stone walls must be 40cm width. Both external and internal walls can be left in their natural stone state or rendered with a suitable plaster. You can specify which (or all) walls are finished with plaster coating. Some stone features can be left exposed to add a touch of character to your home.